Bend Riverside Inn and Suites enjoys just about one of the best locations you can come up with. 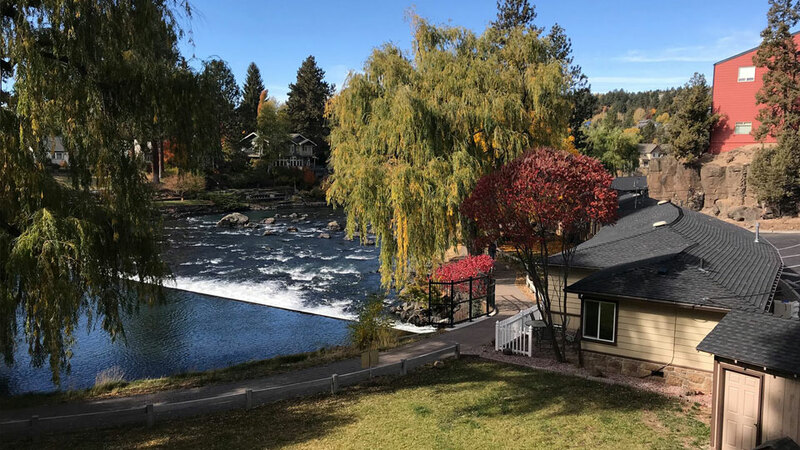 Right on the Deschutes River and with the Deschutes River Trail running almost directly through the property, it’s also next door to a city park and only a few easy blocks from downtown. The hotel sits on five acres of grass and trees with picnic tables. With all that space, it’s a perfect place to travel with pets ($20 per night pet fee). Accommodations range from basic traditional hotel rooms to riverside cottages and the hotel has been recently renovated. Some rooms offer balconies or patios, full kitchens, gas fireplaces, river views and other features that make them stand out. Additional amenities include an indoor pool and spa and free wifi. There is no elevator, so reserve carefully to ensure accessibility. Low season rates for basic rooms begin at $85, cottages at $125, with free gated parking for one car included.